I started looking at where those links were coming from and found an interesting pattern. Almost every one of those links were comment spam, and in many cases there was another comment for one of their competitors next to it with much better anchor text! The more conventional comment spam listed there is pointing at another Holly Springs chiropractor, Holly Springs Chiropractic on Holly Springs Rd. So Dr. Randall Adamson now seems like a spammer right? Not so fast. 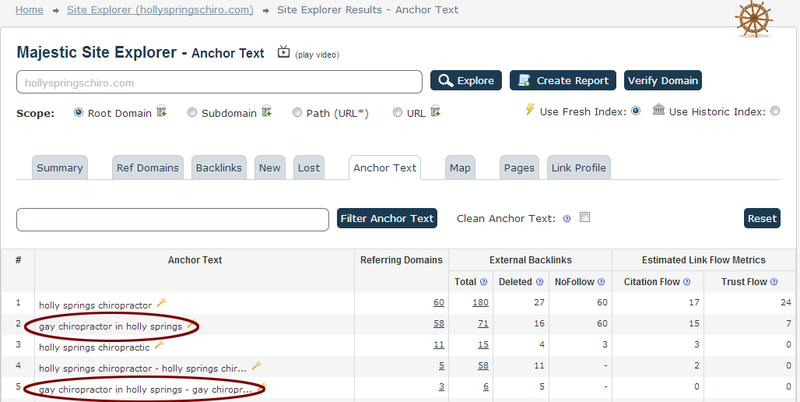 I pull up the backlink profile for hollyspringschiro.com and it has also been targeted with a seemingly unusual anchor text campaign. I moved on to the next Holly Springs chiropractor in the list – Gonyeau Family Chiropractic (hollyspringschiropractor.com). I started looking at some of the pages where their backlinks were originating from and saw some instances where all three of these Holly Springs Chiropractors were being targeted in the same comments. Next stop for Holly Springs chiropractors is Sunset Ridge Chiropractic. Tom and Wendy Popow have been chiropractors for 16 years. 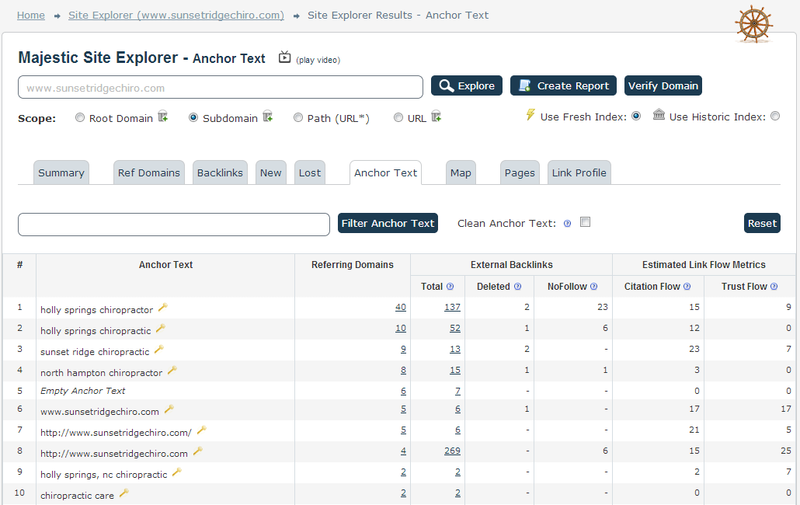 I pulled up there backlinks and saw a slightly over-optimized, but “cleaner” backlink portfolio. The other chiropractor in Holly Springs doesn’t show up in the local pack, but does show up in Google Maps – Trinity Life Center. 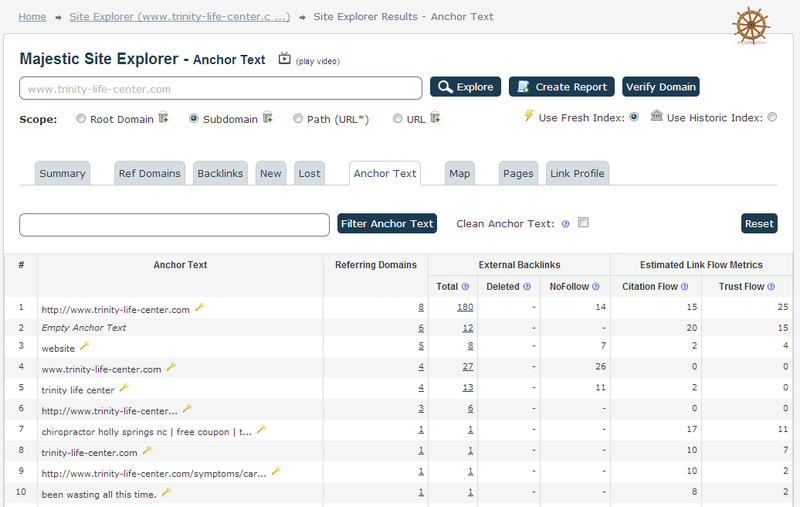 Trinity has the weakest backlink profile, but ranks well organically. Small businesses like these are relying heavily on showing up when people do a normal local search in Google. Someone is trying to push three respected chiropractors out of the search results using an old negative SEO scheme. What they may not realize is that activity like this may be illegal and is usually not very effective. Hi Phil, Nice to meet you here. I have had many clients come to me with this. Not locally, but other cities in the US and overseas. I had a client that got hit several times within months with thousands of links like this. I used to work in-house at an e-commerce retailer who went through something awful right before the Christmas rush. It wreaked havoc for a long time, but they finally pulled out of it. The thing that made this one a little different is that sometimes the links back to the sites would be normal, and other times they would be optimized for a negative phrase. They also linked to multiple pages within the sites, not just the homepage. We too have having this problem and really need help. Our website is http://thestoryhome.com. Google has penalized us. Can you help or suggest a reputable company? Sharon, it doesn’t appear that your site has been hot by someone building links with bad anchor text like in the examples above, but there are lots of ways that Google can impact you manually or algorithmically. 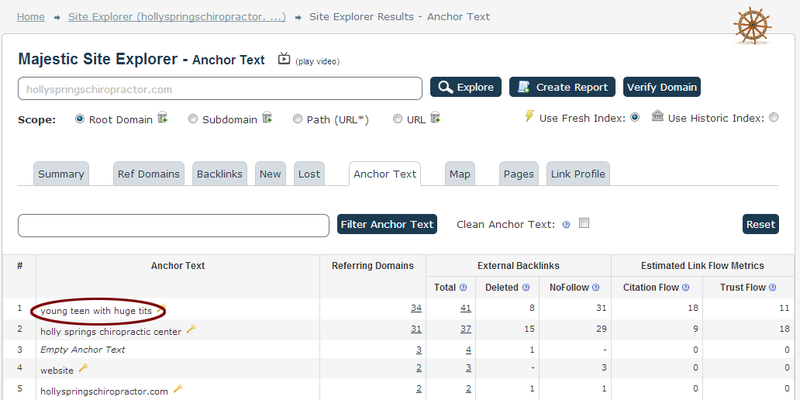 Did you receive a message in your Webmaster Tools that your site is under a manual penalty? You can email me directly at phil@1918.com and we’ll see if we can get to the bottom of the problem.